1. Put the chicken in a pan with the bay, peppercorns, salt and ½ the thyme. Pour over cold water to cover; bring to the boil, skimming off any scum. Simmer for 1 hour 30 minutes. Shred the meat; discard the skin, bones and herbs. Strain the stock; reserve. 2. Clean out the pan; return to the heat with the oil. Fry the bacon until crisp. Increase the heat, add 40g butter and fry the mushrooms for 3-4 minutes; set aside. Add the leeks and carrots to the pan and cook for 5-7 minutes, with the lid ajar. Set aside. 3. Return the pan to a medium heat, add the remaining 40g butter and, once foaming, stir in 3 tbsp flour. Cook, stirring, for 2-3 minutes, then remove from the heat. Gradually stir in the milk and 300ml reserved stock, until smooth. Return to the heat and simmer, stirring regularly, for 7-10 minutes, until you have a thick white sauce. 4. In a large bowl, mix the sauce with the chicken, bacon, vegetables, mustards, parsley and the remaining thyme leaves; season. Transfer to a 1.5 litre pie dish and cool. The filling can now be chilled for up to 3 days or frozen for up to 3 months. 5. Preheat the oven to 200˚C, gas mark 6. Roll out the pastry on a floured work surface so that it is large enough to cover the pie dish with plenty overhanging. 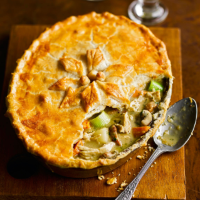 Cut a hole in the centre to let steam escape (or to fit your pie funnel). 6. Brush the rim of the pie dish with beaten egg, then cut 1.5cm-wide strips from the edges of the pastry and secure these to the rim. Brush the strips with more egg, then lay the sheet of pastry over the dish. Crimp the edges, egg-wash the top and trim off any extra overhang. Decorate if liked. Bake for 35-45 minutes, until the pastry is golden and the filling is hot; cover with foil if the pastry browns too quickly.